Peitz is a small town about 100 miles South East of Berlin. During the GDR times it built a reputation for its festival (from 1971 to 1981), where the cream of East German and European improvisers would meet, particularly from the freer scene. Since 2011 a festival has now returned, being as much a live version of a prolific label created over the past decade. (The label includes musicians as diverse as Ginger Baker and Cecil Taylor through to relative 'youngsters' like Julie Sassoon, Peter Ehwald and Christian Lillinger). Musically, its focus has been on where composition meets free improvisation, and that was very much the focus of the festival. Connections between the free improvised scenes on both sides of the Berlin Wall were close, as clearly demonstrated in a new permanent exhibition celebrating jazz in East Germany whose opening was at the start of the festival. Programme books include double bills involving both Trevor Watts and Betty Carter, and photos of Barry Guy with Peter Brötzmann and others from 1971. Intriguingly the exhibition nestles in the Peitz museum between displays of minerals and fish! The festival was exceptional in the range of musicians, which was shown to advantage in different venues in the town. Also, many of them have rarely appeared over here and are mainly therefore known from their recordings. The highlights were in the church and the biggest coup was the opening act - Anthony Braxton solo. Almost nonchalantly he mesmerised the audience for over an hour, each piece seeming to focus on a different element of saxophone capabilities: at one time lyrical, another focussing on overtones and so on. One felt that the apparent simplicity was the result of a combination of deep thinking and much practice. He was followed by a quartet which showed two distinct generations of musician. 'Before the Wall, After The Wall' was reflected in the drummer Günther Baby Sommer and saxophonist Friedhelm Schönfeld from the pre-1989 scene, coupled with improvising vocalist Walburga Walde and stunning pianist Julia Kadel. Sommer, whose kit was beautiful to behold, with a small timpani instead of one floor tom, taught Kadel and Walde. The group effectively was passing the baton to the new generation. Each contributed a piece to the programme which grabbed our attention. In total, 15 groups performed at the festival. It was certainly a great pleasure to hear again Julie Sassoon's quartet, recently recorded impeccably on the label at the Berlin radio studios. It includes Lothar Ohlmeier on saxophone and bass clarinet, Meinrad Kneer on bass and Rudi Fischerlehner on drums. The group enhances the solo impetus where Julie has investigated her own Jewish family past in pre-war Germany. The need to be aware of the risks that may constantly befall us seem most poignant. Wake Up Call was a real tear-jerker, making us double take on how the world continues today. Julie has begun to collaborate with drummer Willi Kellers, who for many years worked with Peter Brötzmann and also our own Keith Tippett and Dave Tucker. 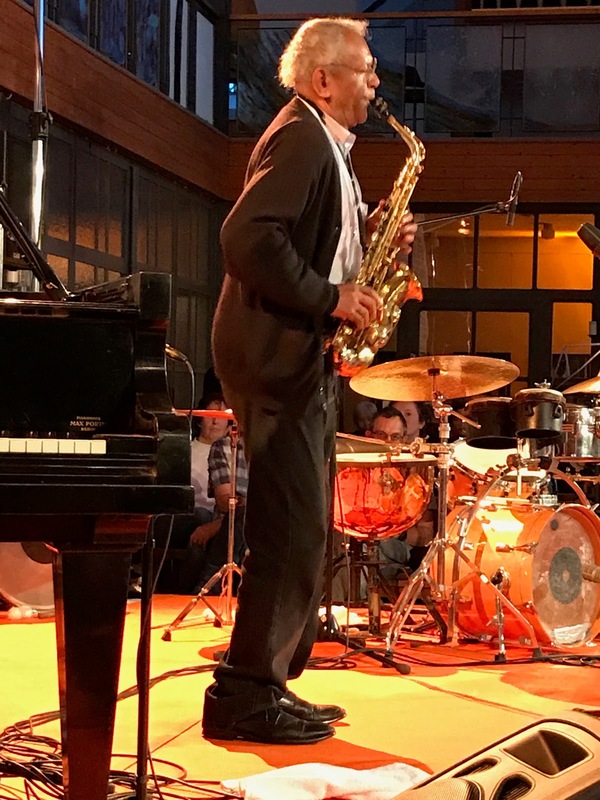 He was part of an emotionally-charged quartet, Double Bass, led by veteran saxophonist Thomas Borgmann with two basses, Joel Grip and Jan Roder. Even though in a beer garden at midnight, the power of the musicianship shone through. Another former pupil of Sommer is Christian Lillinger. He, along with two other musicians from his generation, guitarist Ronny Graupe and bassist Johannes Fink, gave an impetus to clarinettist Rolf Kühn, brother of Joachim and now a sprightly 87 years old. Benny Goodman meets contemporary jazz! Many of the other performers were in duo: Claus Ludwig Hübsch, on tuba, with Phil Minton - often impossible to tell who was doing what from listening alone; Heinz Sauer and Uwe Oberg playful with originals and Monk; Achim Kaufmann (whom we have heard in London with Olie Brice) in duo with tough saxophonist Gebhard Ullmann; and, in the museum, Pascal Niggenkemper on bass (who was recently in London with Robin Fincker) adding imaginatively-placed metal dishes to help his bass resonance in duo with Thomas Heberer, best known as trumpeter with the ICP Orchestra, who took advantage of the acoustics and size. It was also a greast pleasure to hear Miroslav Vitous in duo with Polish saxophist Adam Pieronczyk. He achieved a great resonance especially when using the bow. The atmosphere at the festival was very familial. Many of the audience seemed good friends going back many years. As Anthony Braxton pointed out, the future of the music into the 21st century seems in good hands. Jazzwerkstatt will be at the Vortex on 24 and 25 November. Groups confirmed include Julie Sassoon Quartet, Peter Ehwald/Stefan Scheune/Tom Rainey, Alan Skidmore.